With the ICO, Aimedis aims to finance the global roll out of its blockchain- and AI-based eHealth platform, offering investors a unique chance to tap into the revolution of the way patients interact with doctors. 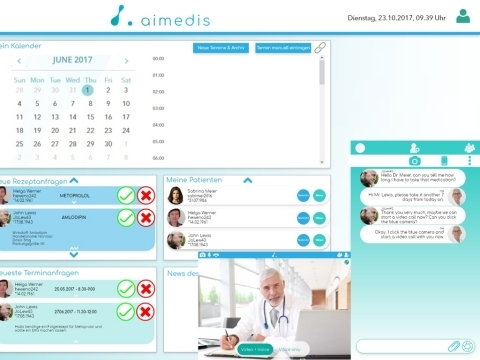 Dutch eHealth-provider Aimedis, creator of a blockchain and AI-based platform that allows patients and institutions to safely store and share health information, such as diagnoses, x-rays, blood screens etc., as well as it enables them to perform video consultations, or to get prescriptions for drugs online, now offers AIM, the cryptocurrency to be used for all kinds of services within its platform, to the public. The leading benchmark portal for ICOs, www.icobench.com, rates the Initial Market Offering with 4.6 out of 5 possible points, making the AIM-ICO the currently one of the best-rated eHealth ICOs on the portal. Above all two arguments lead to this TOP-rating: First, that the system is already live and is used by larger hospital corporations in Germany, and secondly, that behind the Aimedis ICO stands an Advisory Board of internationally renowned health “celebrities” that contribute to the success of the platform.